Our starting point was the region Scooter on jokaydiaGRID, and a total of 21 avatars made the journey together. Since the region Scooter on jokaydiaGrid and the region Lbsa Plaza on OSGrid are very far away from each other on the Hypergrid (about 9,000 regions apart), we had to make 3 hypergrid jumps and visit 2 different intermediate grids during our journey. A challenge! Waiting for folks to arrive on jokaydiaGRID. From there, we all jumped to the region Gateway1 on Sanctuary grid. We were very fortunate to meet Shaun Emerald, the grid owner, who was kind enough to welcome us as we arrived. Thank you again Shaun! Arriving on Sanctuary grid. Be sure to check out all the cool Hypergates if you visit. 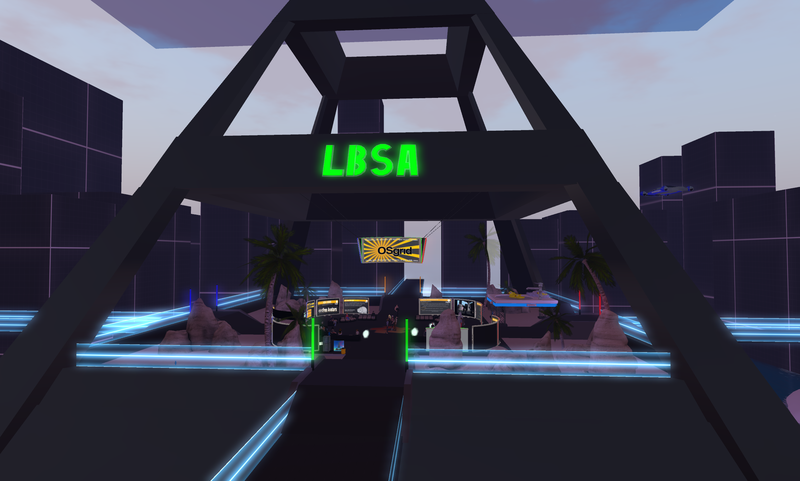 And finally, a jump to the region Lbsa Plaza on OSGrid. Lbsa Plaza is the main landing point for OSGrid, so there are always some folks hanging out. 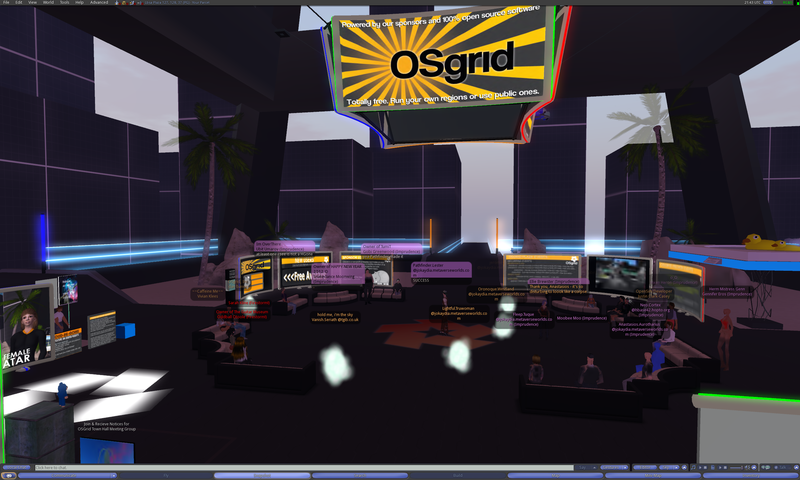 I saw a few comments from folks who were amazed by the sudden arrival of over 20 visitors via the Hypergrid. We even ran Justin Clark-Casey, an OpenSim core developer. Nice to see you again, Justin! This entry was posted in Announcements, Hypergrid Adventurers Club, OpenSim, Pioneer Lessons, Virtual Worlds and tagged avatars, HyperGate, HyperGrid, Hypergrid Adventurers Club, jokaydiagrid, metaverse, OpenSim, opensimulator, osgrid, ReactionGrid, virtual worlds by John "Pathfinder" Lester. Bookmark the permalink. Hi Gobi. I’m very glad you had a good time. I can’t seem to load that page (it says it doesn’t exist). Can you double check the URL? I’d love to read what you wrote. Thanks, and hope to see you again soon! the original link does error out- thanks for the heads-up ! but if you get to that blog try the homepage; then, click on the “Hypergrid Adventurers Club…” link under RecentTopics in the right column- then click to read the full post. Hi Lucy. Thanks for the info! Yeah, I seem to be getting the same result (“Could not teleport. Destination refused: Unable to verify identity.”) I’ll check with jokay and our ReactionGrid team to see what’s up. Thank you again for letting me know about this. I also tried and got the same error message. Perhaps the Scooter grid is a walled garden, outgoing only? There are “JUMP” regions on OSGrid, with access to other HG grids directly. The jump regions provide access points if more than 4096 regions away. You can also go direct to Lbsa Plaza via Lani region. HGAC is welcome to meet any time in Lani region of OSGrid. The sim runs on a fast server in a data center, at middle grid coordinates, with access to both lower grid and upper grid. It is HyperGrid 24/7 with both HyperGate and OSGrid Stargate (Pepper Next’s MilkyWay Stargate) and a sandbox area is available. Let’s visit it for tomorrow’s meeting (11am EST)! 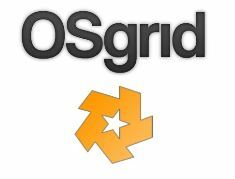 Each grid owner sets their own pcieolis. And content creators can set the permissions rights as usual on their items however they wish (free, copyable, no-copy etc.). As I was traveling to different grids, I noticed how some wouldn’t allow me to transfer any content I obtained from the grid to a different grid. On others, I could acquire freebie items and keep them with me in my inventory wherever I went. There are definitely challenges ahead in terms of setting up a trustworthy “universal currency” across these different grids, and making sure content creators can adequately protect their work and create viable businesses.But this all reminds me of the early days of the web, when many folks would exclaim “Online businesses will never work. Websites will never be trusted enough to keep credit card information safe. No one will be able to make a living if they put their stuff up on the Web.”Nature finds a way. Get one of the [LGS] Myriad hud/meters and go to the basement of Central Pyramid… there you can play the Crystal Quest Adventure RP Game. (watch out for monsters, good luck I hope you all survive). We had a blast! Thank you for the tips!